When my clients bought their dream house in the West University area of Houston, the interiors weren’t very dreamy. The 6,000-square-foot house featured a lot of red and gold, as well as faux finishes. Because they loved the location, my clients wanted to really love the inside of the house, too! So I planned a much more serene space that would fit their lifestyle! Living room designed by Beth Lindsey Interior Design. Project photos by Nathan Schroder. The clients have two young children, so they wanted a relaxed but chic interior, one that would welcome guests but still hold up to their kids. BEFORE photo of the living room. The living room had great bones, but needed a few updates, as you can see above. In the design I created below, I used fabrics that would stand up to the wear and tear of kids, but would still offer a gorgeous entertaining space. 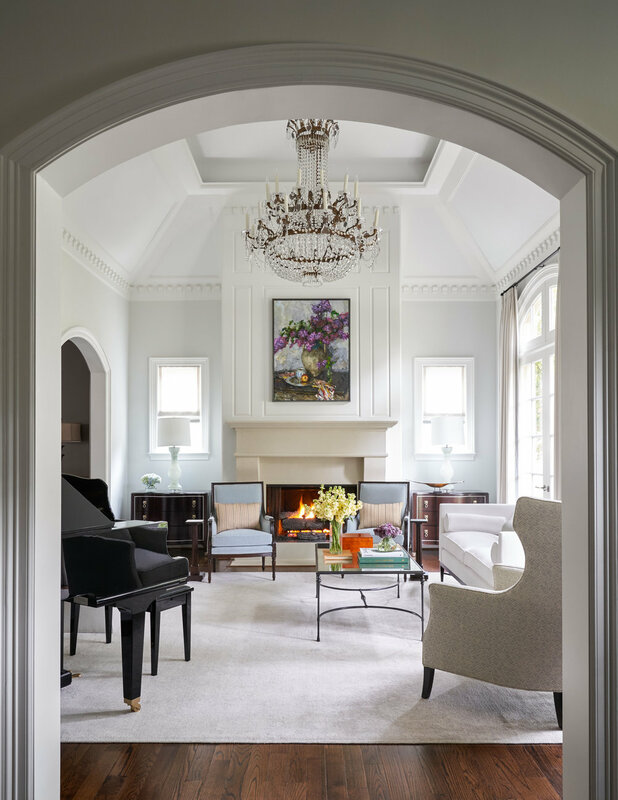 Living room designed by Beth Lindsey Interior Design. For example, on the gorgeous sofa from Bolier, I used Perennials fabric. It’s stain-, fade-, and mildew-resistant, and can be used indoors or out. So there are no worries about spills! The chests in the back from Bernhardt are a great counterpoint of dark against the lighter re-faced fireplace. And the custom rug from Rug Mart is a perfect anchor to the space. BEFORE photo of the powder room. You can really see how dated the decor was when you look at this powder room and its incredibly heavy mirror. That thing was a giant! Powder room interior by Beth Lindsey Interior Design. I love the more modern look of a vanity that resembles a piece of furniture, so the Ronbow Amora Vanity was my first choice! And how gorgeous is the Acanthus Stripe wallpaper from Schumacher? The powder room is the perfect space for a bit of drama, which is why I chose this pattern. Sconces from Circa Lighting add the perfect final touch. BEFORE photo of the study. There was a study that connected the living room to the family room, but it was an unused space for this family. Since they love to entertain, we decided to transform it into a home bar with wine storage, perfect for when they have dinners or parties. Interior design by Beth Lindsey Interior Design. We added wine columns on either side, and I used frappuccino marble as the bar surface. The cabinetry is all finished with a custom stain. BEFORE photo of the family room. The family room was also dated, and it seemed dark with those shutters over all of the French doors. I knew I wanted to lighten the space and make it fresher and modern. Family room interior by Beth Lindsey Interior Design. Benjamin Moore Paper White on the walls really brightened everything up. And look how gorgeous the windows are now! I used a linen from Schumacher to keep that light streaming in, but still offer privacy when needed. The custom sofas are covered in a lovely Kravet fabric, and that chunky cocktail table from Vanguard is a perfect scale for the room. The Bernhardt barstools you can just see in the back are at the kitchen counter. As you can see in the before photos above, the kitchen was technically open to the family room, but only with a passthrough. It needed more open space, so we created a peninsula island that you can see below. Kitchen by Beth Lindsey Interior Design. This is a great place for the kids to do homework or to eat breakfast, and lets the whole family spend more time together. Kitchen designed by Beth Lindsey Interior Design. I designed a much more modern and up-to-date kitchen, too, with the help of the Ferguson showroom in Houston, where I found the perfect appliances and plumbing. The completed kitchen is one of my favorites! I love the Walker Zanger tile we selected for the backsplash behind the range, and those pendants from Circa are magic! On the opposite side of the kitchen is a breakfast nook - but it was also closed off with a bi-level bar that was difficult to use. Kitchen design by Beth Lindsey Interior Design. Taking out that bar and extending the cabinets gave my clients a gorgeous and open space with a great flow that’s perfect for gathering with friends and family. BEFORE photo of the breakfast area. The old plantation shutters on the breakfast room windows were heavy and dated, and so was the counter area. There were also some awkward angles created by the bar into the kitchen. Interior by Beth Lindsey Interior Design. The more open breakfast area is so much fresher! And I designed a custom round dining table to allow the family to gather together for casual meals. The cabinetry in the breakfast area is so much more functional, providing a lot of needed storage for this young family. BEFORE photo of the master bathroom. My favorite before-and-after of the entire project, though, is the master bathroom. Check out all of that gold (and slightly pink) fabulousness. Definitely an older look, and one the clients wanted to change quickly. Bathroom design by Beth Lindsey Interior Design. I wanted to give them a more spa-like bathroom - one that would be an oasis for them. The paint color helped provide that serene feeling - it’s Benjamin Moore’s Adagio on the cabinetry and Paper White on the walls. The sconces from Circa really fit the room, with the nickel finish and the acrylic rod that extends down below the wall plate. The tub and shower both needed a serious update. I wanted to create a feeling of clouds and air, and the Walker Zanger tiles helped bring that to life. 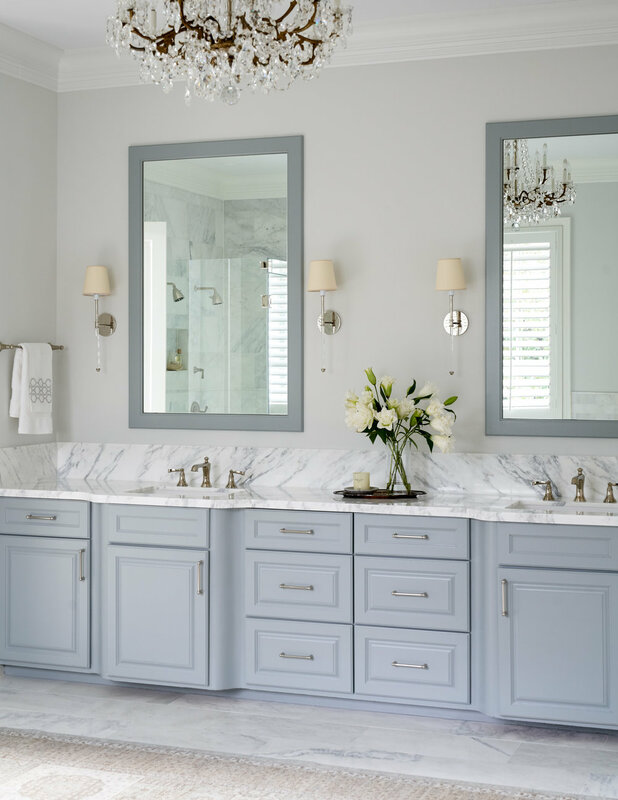 Bathroom designed by Beth Lindsey Interior Design. I enclosed the shower in glass with minimal hardware, which created a more open space in the bathroom. And that tub from Victoria & Albert is much sleeker and deeper - more like a soaking tub. So great for the idea of an oasis. What do you think about my transformation of this serene space? Let me know in the comments section below!